Mostly, bedtime is a happy time, and Kevin likes it very much. Mama tucks his teddy bear beside him, pulls the covers snugly under his chin, and kisses him on the head. But when she turns out the light and closes the door, well, that’s when Yamboo comes out of the closet. It’s true. There really Is a monster lurking in the shadows of Kevin’s closet. He’s Big! He’s Ugly! And he’s very, Very SCARY!! Every night Yamboo sneaks out and slithers across the floor. He opens his huge jaws, revealing sharp teeth, and roars, “Booo!” Kevin is so frightened he cannot go to sleep. Mama rushes in, but she is annoyed. She opens the closet door and shows Kevin the empty space inside. She doesn’t see Yamboo, now lying in wait behind the toybox. What is Kevin to do? Don’t worry. Help is on the way! Sent from the Realm of Fairy Guards, Cornelius does battle with the fearsome Yamboo. He defeats the monster soundly, and sends him on his way. Safe at last with Cornelius standing by, Kevin cuddles his bear and drifts into a peaceful sleep. Your child can sleep better too, when s/he hears about Cornelius the Fairy Guard. I can recommend this book to your followers because it’s fun and easy to read, and offers a solution to a real-life problem facing little children (and their parents) at bedtime. You can get a copy of this book on Amazon. Should you wish to, you can connect with the author on Twitter. 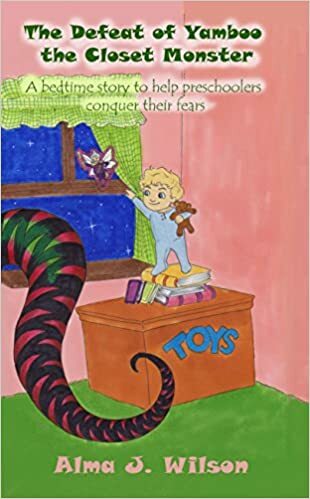 This entry was posted in Uncategorized and tagged A Bedtime Story, A Bedtime Story to Help Preschoolers Conquer Their Fears, Alma J. Wilson, children's books, the Closet Monster, the Closet Monster: A Bedtime Story to Help Preschoolers Conquer Their Fears, The Defeat of Yamboo, The Defeat of Yamboo the Closet Monster, The Defeat of Yamboo the Closet Monster by Alma J. Wilson, The Defeat of Yamboo the Closet Monster: A Bedtime Story to Help Preschoolers Conquer Their Fears. Bookmark the permalink.